I kinda feel like a Jedi Knight in this on point duster. With its long lines, wide sleeves and billowing shape, I’m channeling Obi Wan Kenobi, gifted in the ways of the fashion force. I slip it on and I feel like a “chosen one”, trained from birth to be a guardian of the universe’s style. Everyone has something in their wardrobe that makes them feel like a superhero when they slip it on. For me, I feel like Wonder Woman in my Elsa Peretti Bone Cuff or like an Egyptian goddess when I put on my wide, gold hoop earrings. When I ordered this long cardigan from Shein to keep me warm during the September and October nights, I didn’t expect to open a box containing a robe of sorts that would make me feel like Anakin Skywalker before, you know…the whole Darth Vader thing happened. Seriously though, when I wear this out and about, people take notice. I’m looked at like some sort of worldly member of the fashion order. It also makes me feel like I can take on the world…all I need is a light saber. This lovely cardigan is now on sale at www.shein.com for $27.99. A small price to pay to become a fashion master. One more thing, you get 40% off your purchase of US$55 or more on www.shein.com right now. Happy shopping and may the fashion force be with you. Hahahaha beautiful jacket Dom… this post made me smile so hard. ❤️️? Haha! Glad you liked it and thanks for your kind words! That jacket is stunning! And those jeans look amazing on you! I love Shein! Thank you, Rachel! I love it too. Can’t beat the prices! Love that jacket!!! Great outfit. Oh gosh this is so lovely and I think you have described it so perfectly!! You look stunning! Thank you so much! I’m seriously in love with this long cardigan! The colors are so pretty together. Makes me think of summer. And LOVE the purse! Thank you! That purse is my baby. LOL! You are officially my new style inspiration! I have to admit, last year when I went to the Star Wars movie premier, I wore a VERY obi-wan inspired look that was just items I wore every day! Knee-high boots, black leggings and a long tan duster that looks a lot like the one you’re wearing! I even had a little girl stop me in the lobby of the theater and yell at her mom that she wanted a picture with “the jedi!” haha! It kind of made my day! THAT IS AWESOME! That would have made my day too! Thank you so much for your kind words! This post did so well. I feared that it would be too corny, but it really resonated with people! Love this look! So cute gal! Chic, stylish, and totally Star Wars worthy! Haha! Thank you! How do I get my own Chewbacca? 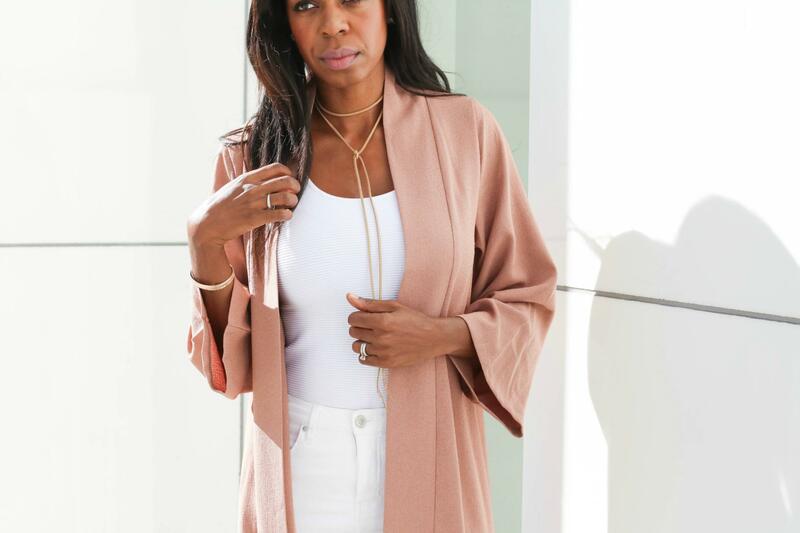 I’m loving the blush duster! I’d totally wear this look as well. We can be Jedi Knights together! Loving this outfit. You paired all the colors together so well. Too kind! Thank you! I love the colours so much. Such a beautiful cardigan! Great color & it looks fabulous with the white pieces! Thank you so much, Andrea! I’m really enjoying this particular piece!